This news item is worrying. Scary, in fact. GPs should ‘not sign off long-term sick’ [BBC] I’ve quoted most of it here, with my responses. People should be signed off for long-term sickness by an independent assessment service and not GPs, a government-backed review says. Strange. The government trusts GPs to run the NHS but not to decide who is too sick to work. Yet they trust Atos and Group 4 who have a proven record of ignoring evidence and making wrong decisions. I wonder which company the government will outsource this “independent” assessment service to? The review also suggests tax breaks for firms which employ people who suffer from long-term conditions. It is estimated the changes would send 20% of those off sick back to work. This is blatantly a move in favour of employers and against employees. Tories always side with people with money. Perhaps the government should instead ask why so many people are sick. Supporting? They mean forcing. Whether it’s what people need for their health or not. Around 300,000 people a year are absent from work due to long-term sickness. Perhaps there is some problem other than people pretending to be sick. Perhaps being forced to do too much work for too little pay is the problem. Perhaps employers should pay more and stop sacking people and then forcing other employees to do the work of more than one person. The review also calls for a new government backed job-brokering service, to find work for people cannot stay in their current job because of their condition. Great idea. But don’t force it on people that shouldn’t be working at all. A survey suggested 77% of GPs had admitted they signed people off sick for reasons other than their physical health, the report authors told the BBC. What, like MENTAL HEALTH? This is an absurd, biased statement that ignores a huge part of health care. The government asked Professor Carol Black and the former head of the British Chambers of Commerce David Frost to consider radical changes to deal with the human and financial cost of sickness absence in the workplace. Ah. “Deal with”. Because it must not really be sickness. If the recommendations are accepted people who are signed off sick would also be put on to Job Seekers’ Allowance, instead of Employment Support Allowance, for a period of three months. This is outrageous. In fact, it’s evil. When someone has been signed off sick the last thing they need is to be forced to look for work. Being made to visit the job centre every fortnight can be very difficult and highly damaging to what little health remains. Looking for a more suitable job means being forced to leave the job you are in and abandon hope of going back which can be crushing. Even if there are jobs which a sick person could manage to fit around their problems, most employers would hire a healthy person, which means endless applications and rejections which cause stress, which in turn aggravates both mental and physical health problems. Sometimes a GP will sign a person off work because they need rest, both physical and mental, in order to recover from their illness. The government’s new policy to deal with the costs of sickness in the workplace appears to be to pretend that people aren’t sick at all. COHPA has been active politically in trying to represent the interests of commercial OH providers to Dame Carol Black, Government and key bodies in the industry. It seems likely that Atos will be well-placed to bid to carry out these assessments. Author LatentexistencePosted on 19th November 2011 19th November 2011 Categories PoliticsTags benefits, cuts, disability, dla, esa, fear, illness, mental health, politics, welfare, welfare state4 Comments on Sick? No you’re not! This guest post written by DarkestAngel and provided to me by Sue Marsh. in the House of Lords and has now moved onto committee stage. be sent to the Grand Committee. peers to attend at once. by any decision to take the whole of the Committee stage off the Floor of the House. will be affected by this, not to mention members of the public who wish to attend. prevent any attempt to fix the faults of this bill. Lords (details below) to express your own concerns over this development. the bill so that the Lords understand how it will, as it currently stands, affect so many of us. We made a difference last time. We can make a difference this time. Liberal Democrat conference voted on Saturday for a motion criticising employment support allowance and Atos work capability assessments. In addition they passed an amendment to the motion which contained much more interesting statements. Page 20 of Conference Extra [PDF] gives details of amendment one for motion F6. This amendment means that LibDems oppose limiting ESA to one year for those that have made national insurance contributions, demand that people with “serious and uncontrollable life-threatening conditions” are given unconditional support instead of having to attend work-focussed interviews, and are in favour of giving legal help to those appealing against being declared fit to work. They also want Atos to be forced to improve their performance, and in future, for the role of assessing people as fit for work or not to be carried out by government or non-profit groups. While this has come late in the day, the Welfare Reform Bill has not yet been passed by the House of Lords and so now that the LibDems have adopted this motion and amendment I am hopeful that LibDem peers might oppose aspects of the bill that conflict with it and either amend the bill or send it back to the house of commons to start again. I don’t know how binding this motion is on the LibDem peers but their previous stance does not have the backing of the party. In fact, when this motion was voted on there were very few people that voted against it at all. There were some excellent speeches in favour of this motion and amendment and I have uploaded some of the best to Youtube – see further down. You can also view the whole afternoon’s proceedings on iPlayer for a limited time. The motion was originally written by George Potter who contacted a few different people for help. In his speech he used Sue Marsh of Diary of a Benefit Scrounger as his main example. However, it’s not all good news. Many LibDems wanted to debate the governments plans for the NHS in the Health and Social Care Bill, also waiting to pass through the Lords. They held a vote on whether or not to debate and vote on the bill during the conference. The vote was 235 in favour of debating it versus 183 against, but unfortunately they needed a two thirds majority to win and so the bill will not be debated. This means that the Health and Social Care Bill will still go through the house of Lords with LibDem support although it might just about be possible to stop it if all the cross-bench peers vote against. Nick Clegg and Simon Hughes spoke during the opening of the conference and talked about opposing ruthless and extreme right-wing policies that the Conservatives are pushing through. They seem to think that they can win back support by opposing the Tories. I think they are wrong. The biggest things that they needed to stop were the cuts to welfare and the massive changes to the NHS, and before that, the scrapping of funding for universities and the introduction of huge tuition fees. I think it’s too late for the LibDems. They don’t seem to have noticed. The headlines today are screaming that a mere 7% of ESA claimants aren’t fit for work. The Daily Mail says that “Benefits Britain marches on: Just one in 14 disability handout applicants are too ill to work” while the BBC claim “Tests claim few benefit claimants unfit to work” These figures are grossly misleading. These actually come from a Department of Work and Pensions press release, 26 July 2011 – Work Programme provides tailored support as latest figures show people are being found fit for work. Those news stories haven’t actually mislead about the contents of the press release too much, the propaganda comes from the DWP. The Express, on the other hand, has gone for “Sick benefits: 75% are faking” which is just an outright lie. Lets start with the figures from the DWP. These figures are true, but lie by omission. First of all, the figures given are for ALL that start a claim for ESA. As stated, 36% of people that start a claim drop out before they even get to their Work Capability Assessment. Some of these people will drop out because they perhaps shouldn’t have applied in the first place. Some might even have been trying it on and then realised that they would be caught. Some recover enough to find work, some find work that fits around their disabilities. Some, however, drop out because they are so ill that they cannot face the application and testing process. We don’t know, as no records are kept of reasons for dropping out, but I contend that many more than we know drop out because they are too ill to finish the process. Given that 36% of claimants are not tested, we cannot include them in the ‘fit for work’ category. That 7% of claimants is actually 11% of claimants who complete the process. 11% is still a very small number. That still casts 89% of claimants as cheats, doesn’t it? Well no. No it doesn’t. Not unless you are a tabloid writer. You see, 17% of total claimantss – or 26.6% of claimants that finish the process – are put in the Work Related Activity Group. Being put in this group DOES NOT mean that the claimant is fit for work! It means that there may be some job, as yet unknown, that the claimant could possibly manage to do, if they push themselves hard enough,possibly at high cost to their health, IF they receive the right support in terms of information, equipment, services and grants. People in this group must attend six interviews at the Job Centre over the course of a few months to try and determine just what this possible job could be, and the support that would be needed to do it. People in this group STILL RECEIVE ESA. Adding those two together and leaving out the people that dropped out, that means that 37.5% of people tested were not fit for work. That still leaves 61% that were receiving ESA who were found fit for work. Are they all cheats? No. Here’s why. The Work Capability Assessment takes place at the end of the assessment phase of the claim. That means the test can take place up to 14 weeks after the person started to claim ESA. 14 weeks is a long time, and it should also be noted that people are often sick for a long time before they even apply for ESA, either on Statutory Sick Pay for 28 weeks, or just unaware that they can claim. Those people could easily have been sick for 9 months before being tested. 9 months is long enough for people to recover or start recovering from many health issues, and so these people would have been correctly being given ESA while unable to work. Health issues change, and finding these people fit for work now would be correct, but does not invalidate their claim in the previous months. I think if the WCA correctly finds someone capable of work after many months of illness but heading towards recovery, this is usually a good thing. Assuming that changes in health conditions account for a chunk of that 61%, let’s say a third, that still leaves the rest. Here’s the thing. The accuracy of the testing process has been found to be wrong, broken, inadequate, however you want to put it, by MPs, a house of commons select committee, many disability rights charities, and many many individuals and activists. Even a person involved in designing the test has said that it is not fit for purpose. 33% of people found fit for work between October 2008 and August 2009 appealed against that decision. 40% of those overturned that decision and were awarded ESA. That’s 27,500 people who were provably found fit for work when they were not. Many more people did not appeal, for many of the same reasons that may have caused people to drop out of the claims process. Today the Commons Select Committee on the Migration from Incapacity Benefits to Employment Support Allowance released its 6th Report – The Role Of Incapacity Benefit Reassessment In Helping Claimants Into Employment. Among other things, that report criticised media coverage and stated that government had a duty to take more care when engaging with media. I disagree with part of this in that I think that consciously or not, Conservative ministers have an ideological motive to move people off of benefits, portraying them as cheats if necessary, with the help of special advisors. (SPADS.) I believe that ministers and SPADS have been feeding selected information to the press to create a national view that is biased against sick and disabled people that claim benefits, and the press have been only too happy to amplify this. Why won’t ATOS let us record our Work Capability Assessments? As you will know if you have read my recent blog post “What’s wrong with ATOS“, there is often a large disparity between what is said during a Work Capability Assessment and what ATOS actually reports to the department of work and pensions. The reports take no account of context in answers (“I can do x IF…”) and often fail to note that an action or activity may be possible for a patient, but will have consequences for their health and may not be repeatable. As a result claims are often appealed and ultimately referred to a tribunal. At that tribunal the patient must demonstrate that the ATOS report is not true for the above reasons. It is permitted for the patient to be accompanied by a friend to witness the assessment, but an audio recording would be the ideal proof. Unfortunately ATOS have made it nearly impossible for anyone to record their assessment. Many people have attempted to record their assessment using mobile phones, digital sound recorders or dictaphones. Nearly every time ATOS have halted the assessment and refused to continue while being recorded. On some occasions the patient has relented and stopped recording, on others they have been asked to leave and their report has stated that they did not attend their assessment, resulting in their benefit being stopped. In a response to a Freedom of Information request made at the end of 2010 the Department of Work and Pensions provided the official guidelines to ATOS staff regarding recording of assessments. The most important parts are quoted here. This is obviously impractical to arrange and priced far out of reach of the patient, who is receiving Employment and Support Allowance to live on, at approx £60 – £100 per week. In a court case in June 2008 a judge ruled on a patient who had been denied benefit and lost his appeal after ATOS reported that he did not attend because he attempted to record his assessment. The judge ruled that he should be allowed to start his assessment process all over again, because he had not been advised that he could arrange for recording of the assessment in stricter circumstances. What is interesting is the other comments by the judge in his findings. 45. The appellant makes a number of good points in this context. He draws attention to the considerable (and probably prohibitive) cost that would be involved for an individual living on benefits in meeting the Department’s restrictive criteria. He rightly points out that those conditions (which include the presence of a qualified engineer) are actually stricter than those in place for police interviews with suspects. He might also have added that the Department’s own protocols for interviewing claimants under caution in the course of benefit fraud investigations do not require the presence of a qualified engineer (although dual-tape machines and sealed tapes are used). Let me repeat that: ATOS’ requirements are stricter than those for police interviews, and stricter than their own interviews for benefit fraud applications. So, we get to the really important question. Why do ATOS make it so difficult to record assessments? There is one relatively good reason. They are worried that a single recording taken by the patient could be digitally altered and then presented before a tribunal as proof. They wish to counter this by having a duplicate recording in their own possession. This does seem a reasonable request, but their chosen methods are over the top and unnecessary. ATOS also state that “Medical Services view unauthorised and secret recording to be an invasion of privacy.” Now, if this were a private conversation between two friends, that might be the case. But this is not. This is an assessment carried out on behalf of the government and with life-changing consequences for the patient. It often starts a process which ends up in the legal system. In these circumstances, it is wrong to claim that recording is an invasion of privacy. In an assessment as grave and important as this, are they really saying that the assessor is going to say something which should not be reported, and that he won’t do so when officially being recorded? Because to me, that suggests that they think their staff might be unprofessional in their behaviour. I think ATOS is clearly wrong to obstruct recording of Work Capability Assessments. At best, this is an uncaring attitude which shows lack of respect for the patient or of any concern over the outcome of their benefit claim. At worst, this is wilful obstruction of justice and a prevention of a proper outcome at a tribunal. There is a simple solution to this. ATOS should allow every patient to record their interview in any way that they wish to, openly so that their staff need have no concerns about privacy. If they are worried about a recording being altered to be used against them, then they should also record every interview themselves. They need not go to the expense of dual recording equipment if they allow patients to make their own recording. Of course, they won’t do this. ATOS must be fully aware of the failure rate of their assessments and the large number of successful appeals against them. They know that if a large number of recordings were to be made, they would be shown up by the vast contradiction between what is said and what is recorded. They would be shown to be either incompetent or to have an agenda against benefit claimants. Author LatentexistencePosted on 22nd July 2011 31st August 2011 Categories WelfareTags ATOS, benefits, dla, esa, pip18 Comments on Why won’t ATOS let us record our Work Capability Assessments? In two weeks I have to undergo a Work Capability Assessment which will determine whether or not I will continue to receive Employment and Support Allowance while I am ill. I will be placed into one of two groups: the Support Group, who are judged sick enough to be left alone to receive ESA, or the Work Related Activity Group, who are thought able to attend several Work Focused Interviews and eventually to be able to work if pushed enough. If by some miracle I am suddenly cured, I could be declared fit to work and moved on to Job Seekers Allowance and classed as unemployed. That all sounds OK, you might think. It sounds reasonable, we have to make sure that sick and disabled people receive support, and the the work shy are sent back to work. But there’s a problem. It isn’t my GP that will carrying out this assessment. Nor is it any hospital specialist. It’s not even the Department of Work and Pensions that will carry out this test, even though they requested it. No, instead of any of these, it is a French IT company called ATOS that will decide if I am fit to work or not. Specifically, a division of ATOS called ATOS Healthcare that has been contracted by the DWP to carry out these assessments and provide “medical advice” at a cost of £100 million a year. “That’s absurd!” you may say. What does an IT company know about health? Well, that doesn’t matter, according to ATOS. They have developed a computer system called LiMA that records the patients answers given in an interview, and makes the decision based on points. It’s all very straightforward. What could possibly go wrong? Well obviously something has, because ATOS is the subject of strong protest. On twitter and on blogs anger against ATOS has been obvious, cropping up again and again. In the physical world campaigners have held extensive protests outside ATOS buildings, with signs and slogans like “ATOS kills” and “ATOS don’t give a toss.” ATOS recruitment fares have been targetted too. When sick and disabled people are scared and angry enough to picket a company, wheelchairs and crutches and all, there might just be something wrong. A commons select committee has been investigating the Migration from Incapacity Benefits to Employment Support Allowance, and while questioning senior executives from ATOS healthcare MP Stephen Lloyd said that Atos was “feared and loathed probably in equal terms” by the families and friends of disabled people. Lisa Coleman, a senior manager at ATOS, said that “fear and misunderstanding” could be blamed on claimants “not really understanding the role that Atos plays”. So what is the problem with ATOS? Well, for a start, the computer can only work with what it is told. And what it is told is keywords. The examiner asks questions about things such as walking, reaching, communicating and controlling the bowels. The answers don’t really matter much, because the examiner stares fixedly at the computer screen and picks keywords and numbers from a list as they are mentioned and the computer assembles them into a sentence and fills in the gaps. This has often resulted in some absurd and misleading statements. Some genuine examples include “usually can do light gardening for 1 minutes” and “The client’s Amputation of Upper Limb is mild. They have seen a specialist for this problem.” Another claimant stated that she pottered about all day; it was recorded as “Customer does pottery all day.” After the questioning is complete there is usually a very short physical examination. The claimant may poked and prodded and instructed to stand up, raise their arms, pick something up, or make other movements. It is all very rushed and does not leave time or scope for much useful data to be gathered. In addition the examiner records observations about the patients ability to walk and talk while at the assessment. This assessment is flawed for several reasons. Firstly, the data gathering process is inaccurate and rushed. Staff carrying out the assessment have strict targets and are expected to get through five assessments in a morning or afternoon session, which allows about 45 minutes per assessment at most. People that have been through the process complain that the examiner spent their time looking at the computer rather than paying attention to them. Once the examination is over the examiner produces a report that may bear little resemblance to the patient’s actual condition. The reports often fail to take into account the variable nature of many illnesses. What the patient can do on one day is by no means representative of what they can do the next, and for someone who is chronically sick or disabled, each task in itself may be achievable but exhaustion and pain can often prevent repetition or moving on to the next task. An ATOS examiner might note that a person can sit at a computer, walk to the shops, cook a meal, and wash themselves. What they fail to note is that it might well only be possible to do one of those things on any given day! Being fit to work in an office, for example, involves a series of tasks – washing, dressing, commuting, sitting, talking, thinking, typing, holding the telephone, holding a pen, making decisions, defending those decisions, and much more. I could do any of those things, sometimes, maybe, but I could not do them all together, and I certainly could not make any guarantees about when I could do them or how long it would take, or even guarantee to do them at all. ATOS cares not. If you say that you can ever manage a task, it is assumed that you can do all of the tasks all of the time. They may well assume that because I could write and record this article, I could write for a living. They don’t see that it took me several days to write including many hours of frustration as my body left me in too much pain or fatigue to think or type. Another flaw is that the ATOS assessment process can often be harmful in itself. For example, I could usually raise my arm above my head when asked. It would result in pain and fatigue which the examiner would not see. It would also be harder to do a second time, and after a few goes I would be unable to do it at all. The ATOS examiner would simply note that I could manage it the first time and would take no account of whether or not I could do it again or what price I paid for doing it. For many people, just getting to the ATOS medical examination centre can be a major challenge. In a letter sent out to notify me of my impending assessment I was helpfully sent a suggested journey plan. It included bus, train and 17 minutes of walking. I do understand that the journey plan is a standard item sent out to all claimants, and this is why they have suggested that I walk despite them being fully aware that I cannot stay on my feet for more than a couple of minutes. But I can’t be the only one that would have trouble with that journey. In fact, I would suggest that a majority of people that claim ESA would find it difficult. Whether that be through inability to stand or walk, or pain, or fatigue, or because of a lack of accessible buses, or through mental health problems that get worse when around other people or attempting a task such as travelling. The problem is that many people will attempt and complete the journey at great cost to their own health, purely because they feel that they have to. Again, ATOS would merely note that the journey had been completed, and not what it cost in terms of pain, fatigue and recovery time. Since ATOS have taken over the assessments for ESA, both ESA and the contract with ATOS originating from our last government, by the way, the number of people being judged fit for work has risen substantially but high numbers of those go on to appeal with a 40% success rate at overturning the decision. That rises to 70% of cases overturned when representation is provided. This has caused alarm to a great many people with groups such as Citizens Advice Scotland reporting “Our evidence has highlighted the cases of many clients with serious health conditions who have been found fit for work, including those with Parkinson’s disease, multiple sclerosis, terminal cancer, bipolar disorder, heart failure, strokes, severe depression, and agoraphobia.” In fact there have been several recent cases where people have died soon after being judged fit for work and while waiting for their appeal. In one case the patient died IN the ATOS building after his assessment. On the day of the funeral his family received a letter notifying them that he had been declared fit for work. Clearly, the Work Capability Assessment needs a rethink. Actually, the whole system by which benefits are controlled needs a rethink. Government insist that GPs can be trusted to take over administration and budgeting of the NHS from Primary Care Trusts, and yet they do not trust GPs and specialists to say whether or not their patient is capable of work or needs to rest at home. The current arrangement for ATOS to assess patients does not and cannot provide for accurate assessment and proper care. Margret McCartney reports for the BMJ: Well enough to work? 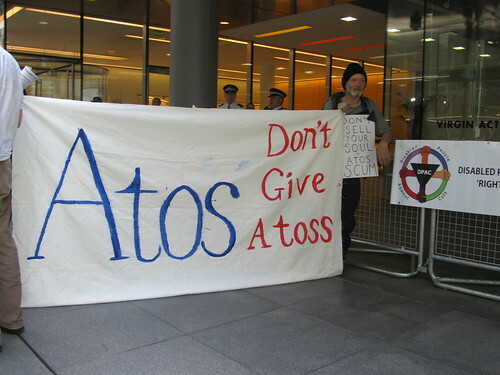 Disabled People Against Cuts: Atos don’t give a toss! DPAC – Debbie Jolly: The Billion Pound Welfare Reform Fraud: fit for work?